With Bitcoin breaching the $5,000-mark, many crypto-analysts and enthusiasts are of the opinion that the crypto-winter is finally over. However, following the collective market pump early this month, prices of all top cryptocurrencies witnessed strong correction, pulling the market into a bearish waters. XRP, the second largest altcoin in the market, fell to a low of $0.29 before recovering and hovering around the $0.32 mark. At press time, XRP was valued at $0.328, with a market cap of $13 billion. The coin registered a 24-hour trade volume of $1.04 billion and was up by 0.85% against the US Dollar. XLM, the ninth largest coin in the world, was valued at $0.115, at press time, with a market cap of $2.22 billion. The 24-hour trade volume of the coin was $255 million and was up by 0.85%. Following the Stellar-IBM partnership, the coin had surged considerably, but has since resorted to stagnant price movement. 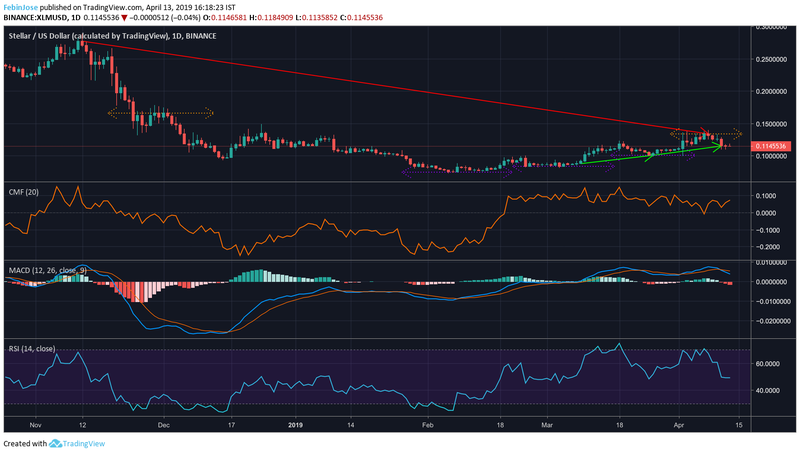 The one-day chart for XRP showed a prominent downtrend from $0.555 in November 2018 to $0.366 in April 2019. Though strong uptrends were not seen, minor price movement was seen between $0.249 and $0.314. The resistances stood at $0.366 and $0.389, while the supports were at $0.305 and $0.293. Bollinger Bands had its mouth open and signified a volatile XRP market. However, the moving average line was above the candlesticks and indicated a bearish market. Awesome Oscillator indicated diminishing market momentum, with prices treading a bearish path. Klinger Oscillator indicated a bearish market as the blue line was under the green line after a bearish crossover. The one-day chart for XLM showcased a strong downtrend from $0.277 to $0.130 and minor uptrends between $0.087 – $0.100- $0.115. The resistances stood at $0.134 and $0.166, while the supports were seen at $0.100, $0.083 and at the token’s all-time low of $0.075. Chaikin Money Flow indicated that money was flowing into the XLM market as the line was above the zero-mark at 0.07. MACD indicator indicated a bearish market for the token as the MACD line was below the signal line. Relative Strength Index showcased an equilibrium in buying and selling pressures at it stood at the 49-mark. 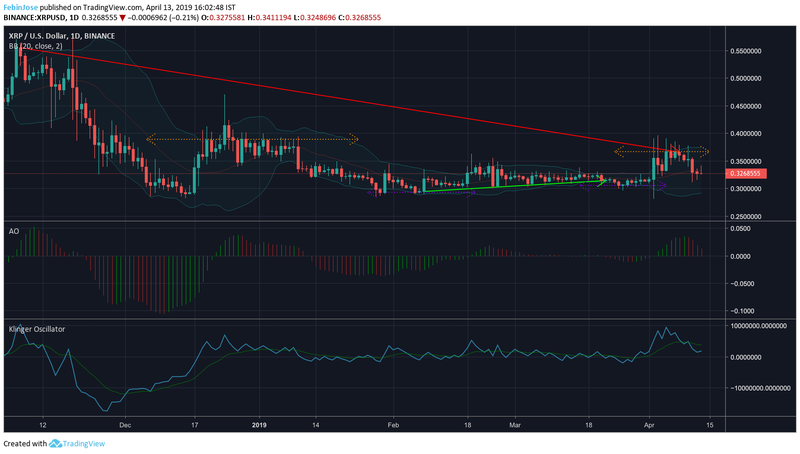 XRP could be moving towards a bearish market environment while XLM seemed to be in a mildly bullish territory.